Doug Pederson’s team is still dealing with lingering injuries, maybe because they stopped playing a few months after everyone else. If you're excited about the Eagles now, just imagine how good they'll be once the preseason ends. That's what this feels like, doesn't it? The Eagles might be 2-1 but they're 2-1 with zero offensive chemistry. Zero cohesion. Injuries all over the depth chart. They're a 53-man construction zone; a work-in-progress running three weeks behind. They're a tantalizing collection of parts whose sum remains uncertain. "You kind of have hopes," said coach Doug Pederson. "You say, 'This is what we think we have.' "
They think they are the best team in the NFL again (they are). They think they can win a second Super Bowl after waiting 51 years for their first (they can). They think they have elite players (they do), but they aren't sure exactly how it will all come together once everything coalesces. "I think we have an idea of the personnel. Individually, we know these guys," Pederson said. "Collectively, as a unit, I think you're still working through the month of September trying to figure out your identity offensively." When they figure it out they will be formidable. Carson Wentz replaced Nick Foles at quarterback on Sunday and energized the entire franchise. The Alshon Jeffery upgrade will be like trading for a top-flight receiver who already knows your system. For the moment, the offense is below average by any measure. Their 19.7 points per game ranks 22nd, down 19 spots from where they finished last season. Their 341 yards per game ranks 19th, down 12 spots. They are 2-1 not because of the offense but in spite of it. The defense carried them past Matt Ryan and the Falcons in the opener and past Andrew Luck and the Colts on Sunday. That defense is eighth in points (18.3). ninth in yards (314.7) and, most significant, second in third-down conversion rate (27.0) and second in red-zone efficiency (33.3 percent), the latter stat thanks to a combined 2-for-10 performance against the Falcons and Colts. "Defense and special teams carries the load early in the season," Pederson said, "and offense plays catch-up." Usually teams enter their season whole, but most teams have an extra month to address any lingering injuries. The Eagles were busy all January, so they're a little behind in September. Wentz, who injured his knee in December, just started his first game, but that couldn't be helped. On the other hand, Jeffery, the No. 1 receiver, has missed the first three games and might miss a fourth Sunday at Tennessee as he recovers from shoulder surgery performed on Feb 20. He injured the shoulder in training camp, so that surgery could have been performed a month earlier — except Jeffery was busy catching two touchdown passes against the Vikings in the NFC championship game. Similarly, left tackle Jason Peters and running back Darren Sproles, who were injured before Wentz last season, could still have used another week or three to let their aged knees mend. Jeffery remains limited in practice. Peters left Game 1 a few minutes early, exhausted; left Game 2 with an injury; and had two false starts in Game 3. Sproles started Game 1 but said he wished he had seen more preseason action, and he has missed the last two games with a hamstring injury. Featured back Jay Ajayi missed Sunday's win over Indianapolis with a back injury. But the Birds are so deep and so well-coached that they gained 142 rushing yards with their third, fourth and fifth backs Sunday — and the fifth one, rookie Josh Adams, was on the practice squad a week ago. "We find ways to win these games early," Pederson said, "it makes a big difference when you get these guys back." It further complicates matters that Pederson's chief lieutenants joined other teams. Former offensive coordinator Frank Reich, now the head coach with the Colts, helped Pederson design the Eagles' attack. Former quarterbacks coach John DeFilippo became the OC for the Vikings, who will visit in two week. He served as a personal tutor for Carson Wentz and resurrected Nick Foles' career. Their replacements are unseasoned. New offensive coordinator Mike Groh has never been a coordinator in the NFL. New quarterbacks coach Press Taylor has never been a lead quarterbacks coach at any level. 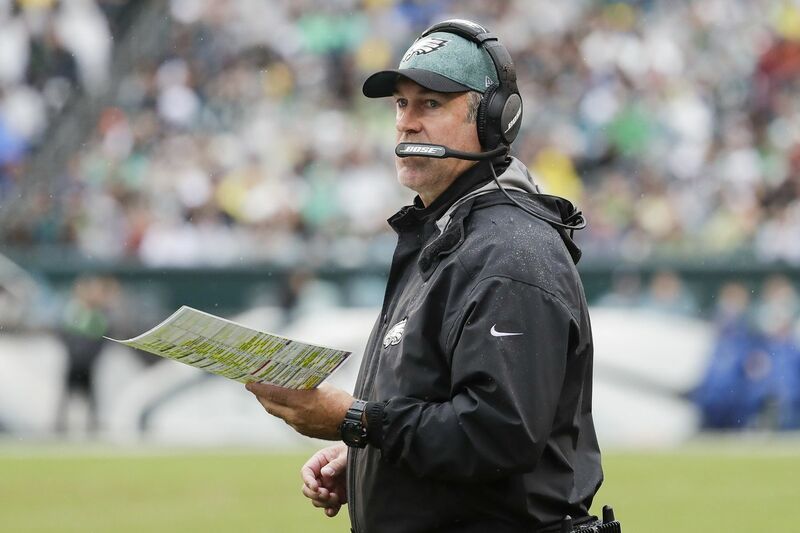 They are tasked with running an offense that, of its top 12 players, lacked two (Wentz and Jeffery), then three (Wentz, Jeffery, and Sproles), then four (Sproles, Ajayi, Jeffery, and Wallace). "It's a little unusual, but it's OK," Pederson said. "When the offense catches its stride — then, you've got a good thing going." He said that with a hopeful lilt. He can't wait for the preseason to end, either.